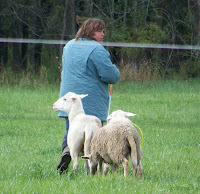 Once a year, my across the road neighbor, Jim, puts on a sheepdog trial. 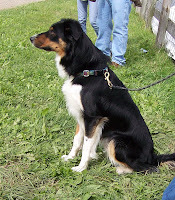 Border Collies come from all over to herd sheep around a course in a cow pasture. The dogs are amazing - they make those sheep 250 yards from the top of a hill down to the bottom, then back halfway up and through a gate, then back again and into a little pen. All of this while being directed with whistles and calls from their shepherd who has to stand at a post at the bottom of the hill. The dogs move at lightning speed, down low and close to the ground. I guess any sheep that sees a dog coming at them like that is going to want to get away. The dogs seem to really love this sport. Even when it's not their turn they sit on the sidelines like avid fans and their eyes closely follow the action. 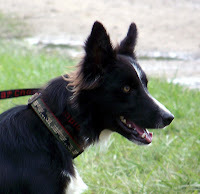 Border Collies are very individualistic - they are all of a type, but their looks vary tremendously. As do the shepherds - there are men and women, young and less young, and all having fun. Watching them is a really nice way to spend part of a day. I wish I could have stayed there all week-end. 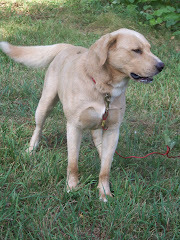 Of course, after just a short visit, I was wishing for a trained Border Collie of my own.